Salisbury resident Sue Noyce shared a story passed down through her family about her grandmother Nellie Massey and her great-aunt May. “There was a potato shortage in the First World War – I think it must’ve been round about 1917 because that’s when potatoes were rationed – and May and Nellie knew somebody who worked at Robert Stokes, he was a grocer in Silver Street in Salisbury, and he got them potatoes. They went into the shop in Silver Street and he gave them potatoes and they put them under their jumpers and smuggled them out of the shop to take home … and apparently this happened more than once. I don’t know who the person was; it wasn’t somebody that either of them married, so I don’t know how they knew him or anything like that. 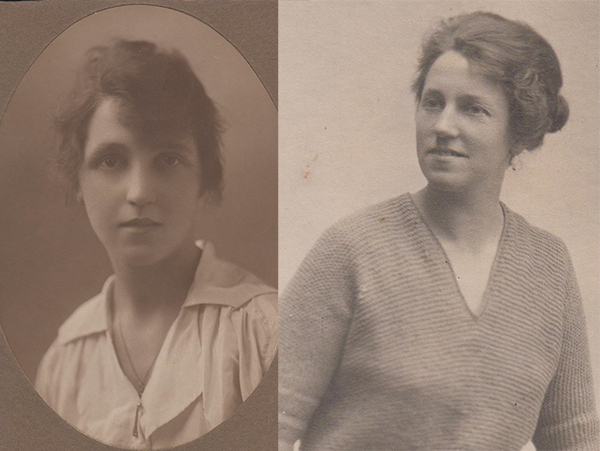 But that’s the story of the smuggled potatoes” May was born in 1890 and Nellie in 1895 but Nellie died in 1944 when her daughter (Sue’s mother) was just 19. Nellie had joined the Women’s Royal Air Force in 1917, working as a Store Clerk at Old Sarum Airfield. She was demobbed in September 1919. Her demob papers, which were sent directly to her father as was the norm at the time, described her work as ‘superior’ and her personal character as ‘very good’. Soon after, she married and settled down to life as a housewife.